The Church of Our Lady of Mercy in the German Cemetery (Italian: Santa Maria della Pietà in Camposanto dei Teutonici) is a Roman Catholic church in the Vatican City, attached to the Campo Santo dei Teutonici e dei Fiamminghi, the German cemetery in the Vatican City. 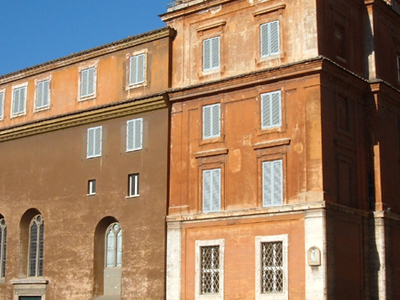 The site belonged to the Schola Francorum, a hospice for German pilgrims which was the oldest German institution in Rome. The term "Teutonico" is a reference to the Germanic peoples. The church is the National Church in Rome of Austria, Germany, and the Netherlands. Here's the our members favorite photos of "Churches in Rome". Upload your photo of Santa Maria della Pietà in Camposanto dei Teutonici!